← GIHIGUGMA KO IKAW BORBON! Have you pass by barangay Lugo and made a brief stop in front of St. Paul Parish in Lugo by the national road? Well if you haven’t been there yet, you are missing one-fourth of your life. Just kidding! When you see buses and cars taking a quick stop by the road side, old and young ladies carrying basket of goods, the church by the ‘eskinitas’, you, my friend, are in Lugo already. What is good about this place is the thriving business of our fellow Borbonanons; selling goods like puto cheese, banana chips, boiled egss, barbecue, etc. But one thing that’s always present in their basket of goods is the famous Budbud Kabog. 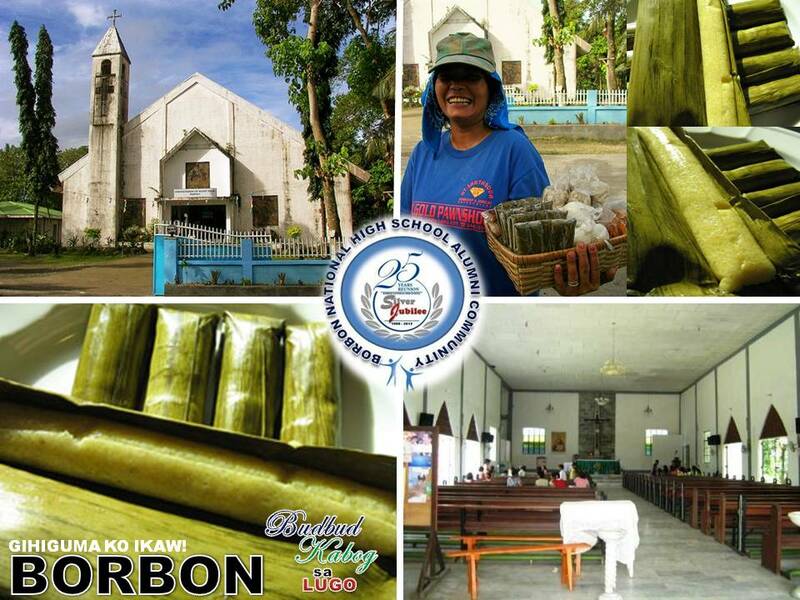 Barangay Lugo is popular not only because of the Budbud ladies but also because of the importance of its road-side church to road travelers. Right beside St. Paul Church is the road which connects Northeastern Cebu to Northwestern Cebu. In short, the road will take you to Tabuelan, Tuburan and other neighboring towns. Instead of going round the northern tip of Cebu through the national road, you can turn left instead, follow this road, and sure you can cut half of your travel time. •The two parishes in the Municipality of Borbon, St. Sebastian Parish & Conversion of St. Paul Parish belong to District VII: Near North Cebu of the Archdiocese of Cebu. •San Sebastian Parish in Poblacion, Borbon, Cebu founded in 1862 while the Conversion of St. Paul Parish in Lugo, Borbon, Cebu was in 1989, the two, under the Vicariate of San Guillermo de Aquitania. •The assigned Parish Priest of St. Sebastian is Rev. Fr. Maximino Agustin Camilo C. Villamor while Rev. Fr. Joselito E. Gutierrez is the Parish Priest for the Conversion of St. Paul Parish.